I was a huge fan of the first Lego Movie. It seemed to come out of nowhere with it’s insane humor and surprising heart to win over audiences with what everyone had assumed would just be a 90 minute commercial. 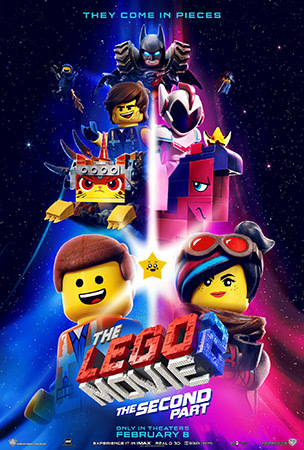 In fact The Lego Movie was the last film I rated an eight or better here at Animated Views, making it, according to me at least, the best animated film of the last half decade! So did the usual sequel letdown happen with The Second Part? Could the filmmakers get that same emotional punch in a followup when we already know the twist about the toys and the real world? In short, is everything still awesome? Things pick up exactly where they left off in the last film with Emmet and his friends thwarting Lord Business’ plans before being set upon by Duplo monsters — the implication being that these were the creation of the real-world Finn’s sister Bianca. These weird creatures spend the next five years raiding Bricksburg of its parts and people, turning the town into the dystopian but much cooler Apocalypseburg. (Again, consider the real-world insinuations!) The resulting chaos has toughened and hardened the townsfolk… except for Emmet who remains exactly as he was in the original film, much to WyldStyle’s chagrin. When the latest attack results in all his friends being kidnapped, it’s up to Emmet to grow up, to save them and the world they have built. The good news is everything is still pretty awesome. It doesn’t have the same feel as the original because of the new settings. There also isn’t as much of the meshing of different Lego universes that made the first movie so fun. Instead we get more original creations, partly dictated by the needs of the story. It’s also missing some of the depth the first one provided. But once you move past that, the humor and heart are all there. One of my biggest complaints might be an age old sequel issue: what to do with side characters from the first film. I feel the best thing to do if you don’t need them is to give them a quick cameo at the beginning and move on. But too many films, this one included, try to shoehorn them in and they end up getting short shrift. So Unikitty, Benny, and MetalBeard all come along on the journey… but then are given nothing to do. But if that’s one of my biggest complaints, I guess they must have done a pretty good job overall! I don’t like to get into specific plot points in these spoiler-free reviews. But I do want to touch on something I couldn’t mention in my review of the original film. In that movie, the big reveal was this whole story was happening in the mind of a child at play. And what at first seemed to be nothing more than a non-stop joke-fest, became a moving look at the relationship between a parent and child. Knowing this going into the sequel, I assumed that aspect of the plot would be downplayed since it was no longer a surprise. I was very wrong. Part of what makes the feel of The Lego Movie 2 different from the first is that something different is going on in playtime. And the eventual reveal of that plot line throughout the film might be an even more emotional journey that the original. However, due to that part of the story, there are some things about the film that can be perplexing. For example a wedding that felt odd and out of place. Some dialogue that seemed designed to confuse. And characters sometimes acting out of character. But by the end of the film — and considering some context you might have to figure out for yourself — these issues aren’t huge and in fact may actually make some sense after all. One thing that might surprise viewers going in without having read a lot about the movie is that it is much more of a musical this time. The songs are fun and catchy — though nothing at the level of Everything is Awesome! The score is fine but not very memorable due to all the songs you’ll be humming instead afterwards. I really enjoy the animation in these Lego movies! Part of it is the imaginative ways the artists come up with to show things like smoke, fire, or water. But I admit a big part of it is some of their ridiculous choices. For example, the new mini-doll figures in this film, like the toys themselves, don’t have articulating legs. So how did they animate their movement? Exactly as a child would move them when playing: by having them wobble side to side from leg to leg! It would’ve have been so understandable — and probably unnoticeable — to just animate the legs moving normally. But embracing the limitations of the actual toys is impressive and occasionally hilarious. I’m also amazed at how expressive they can make those minimal mini-fig faces! The voice actors seem like they’re having such a good time! Obviously the returners are great. Chris Pratt pulls double duty with new character Rex Dangervest, and has a lot of fun kind of parodying himself. Tiffany Haddish (who I like — in small doses!) is pitch perfect as shape-shifting Queen Watevra Wa-Nabi. And Stephanie Beatriz as General Mayhem is sweetly menacing. The Lego Movie 2 is very different in many ways from the original. It’s probably not as funny. It’s not coming out of nowhere to knock your socks off. And it’s not as profound as the first. But it has all the heart and the same emotional punch — maybe more! That’s an impressive feat since the first movie did it so stealthily while here there are no secrets. Just goes to prove that like there’s no one right way to play with Legos, there’s more than one way to build an awesome Lego movie. This entry was written by kelvin, posted on February 12, 2019 at 6:00 pm, filed under Animation. Bookmark the permalink. Follow any comments here with the RSS feed for this post. Trackbacks are closed, but you can post a comment.